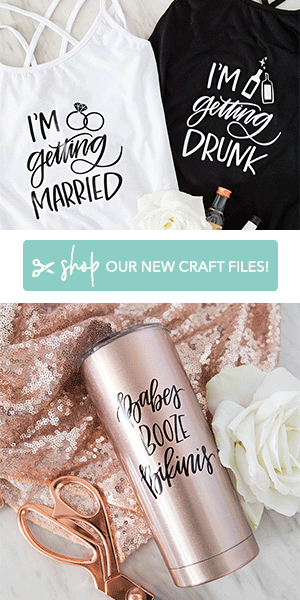 Fall Wedding Fashion Ideas From Dress for the Wedding! Hi! It’s Sukey from Dress for the Wedding back with a look at fall fashion! 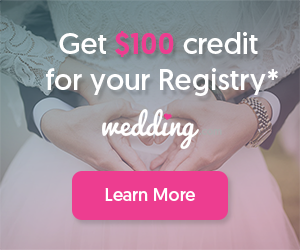 For many of us, fall fashion means warm layers, chunky knit sweaters, fuzzy socks, and generally cozy clothes, so it only makes sense that things get a little cozier in autumn wedding fashion, too! It’s a great time to wear some of the colors of the season and to add touches of florals and accessories that have a bit of that autumnal enchantment. 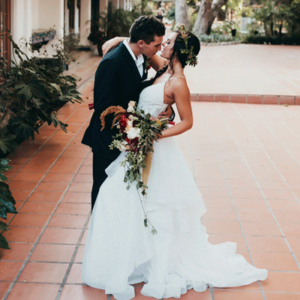 Here’s a peek at some fall wedding fashion ideas for a bride, groom, bridesmaid, and guest! The focal point of many bridal looks is the dress, and this Badgley Mischka gown is certainly a stand out. Fall can be a great time to wear a bit of a sleeve; either a full-length sleeve, a jacket on top of a strapless gown, or — like this dress — a cap sleeve with a bit of embellishment. 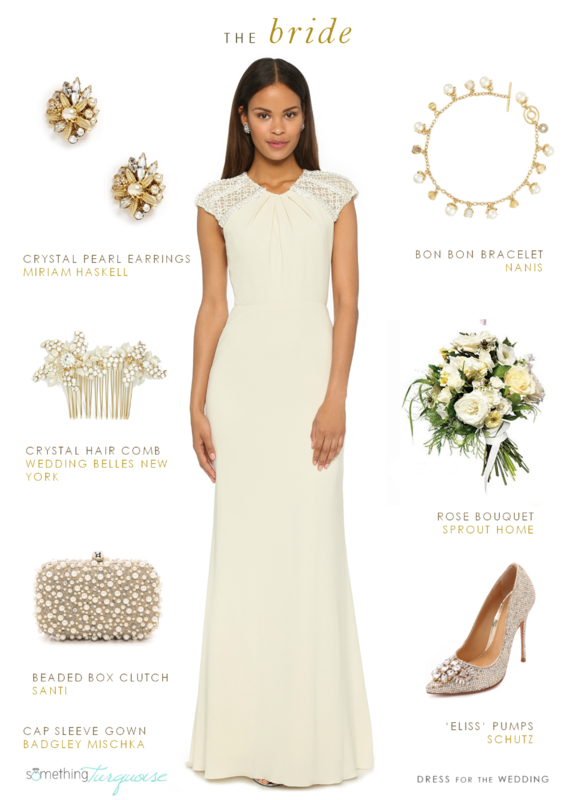 These sleeves are beaded and add a rich dimension to this beautifully simple gown. I selected some gold and pearl accessories to play up the beaded embellishment and ribbon pattern found in this sleeve. Using warm gold tones, floral or nature-inspired accessories, and jeweled touches is a great way to warm up a bridal look for autumnal weddings. The suits for the grooms and groomsmen can also reflect fall colors and textures. This chalk stripe suit gives a bold but tasteful textured look. 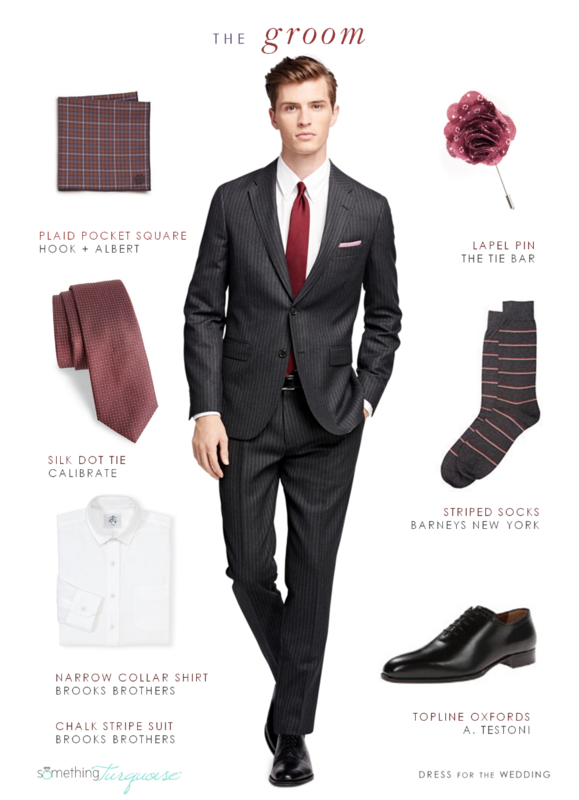 Adding a pocket square and rich red accessories against gray makes this a classic look for a fall groom. 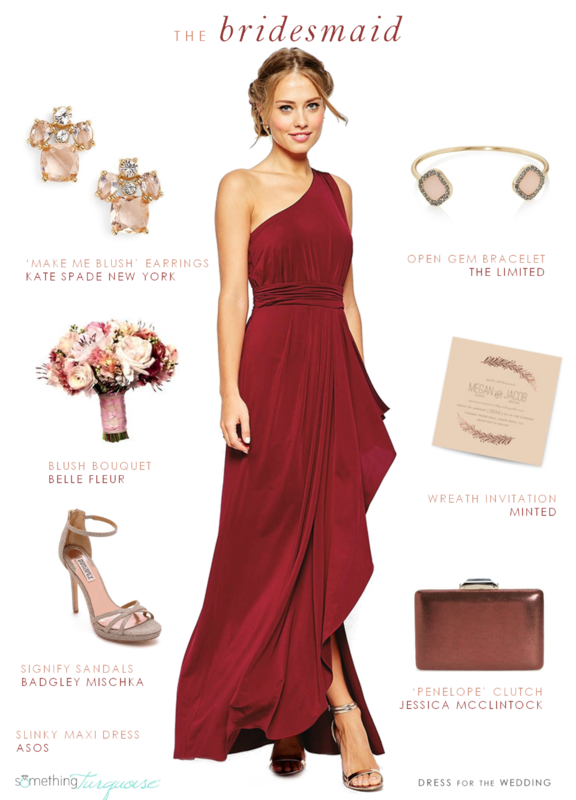 This burgundy red shade is such a popular color for fall bridesmaids, with great reason! It’s a flattering color, it plays beautifully off of the colors we associate with the harvest and fall, and it’s pretty and festive! But don’t be afraid to eschew the usual bold gold, bright orange, and vibrant red of fall’s changing leaves, you can always a muted turn instead! Blush, peach, mauve, and other pastels can give fall standby colors a new elegant look with these understated and softer versions of fall shades. I love the combination of blush and a russet red like this. For fall wedding guests, it’s a great time to wear seasonal colors too. This shade of purple is one of my favorites for fall, and a shift dress like this one, gives a little coverage with the sleeves, but has skirt shape that is great for dancing later. Want something longer? This season there are lots of long maxi dresses with sleeves for fashionable fall-wedding ready looks! 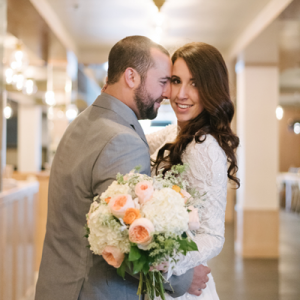 When looking for fall wedding dresses, think about a sleeved gown, a lace or chiffon topper, a cozy wrap for a strapless dress, or perhaps even a cardigan if it suits your style! Not only will it keep you warm, it easily adds a second look to your dress, acts as coverage for a church ceremony, and it will bring in a new texture. Fabrics and accessories can be heavier and richer in the fall. Think about gold and bronze metals, chunky jewels, and layered fabrics or rich silks and weightier textures for this season! For men’s suiting, warmer fabrics like tweeds and flannels, in tones of gray, blue, and brown make a great fallish look. Adding a layer like a vest, some meant-to-be seen socks, and cozy textures like plaid make the style very seasonal! Choices in florals go a long way toward infusing any look with a fall tone. Select bridesmaid dresses and other colors that will either pick up on a few of these colors, or will provide a beautiful contrast to the floral shades you choose. For instance, rich golden flowers with red, orange and yellow, will pop against colors like burgundy, purple and teal. If you find some traditional fall colors too bold, use a muted pastel versions to bring the same seasonal warmth but it a more neutral way. Soft peach, pale yellow, dusty blue, and sage green all make beautiful accent colors for the fall! 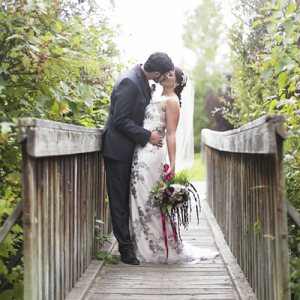 Fall wedding guests should feel free to wear fall colors as well. Take hints from the invitation for formality, and colors you might want to avoid. Rich colors like deep purple, navy, dark green, and dark reds and deep pinks are both festive and seasonally appropriate! Thanks for following along with my guide to fall wedding fashion! If you are stumped for a specific event, I have lots of fall wedding guest outfit ideas on Dress for the Wedding to help! See you soon back here for some holiday fashion fun! 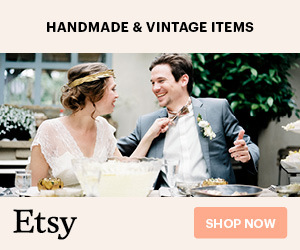 Sukey Murphy is the editor of Dress for the Wedding, the wedding style blog with attire ideas for everyone in a wedding — couples, brides, grooms, bridesmaid, mothers — even the guests! Her sourced and fully shoppable collages will help you get inspired and find your wedding by style, color, formality, or season. She is thrilled to have Dress for the Wedding’s style ideas be a part of Something Turquoise!